The positive crankcase ventilation (PCV) valve is an emissions device that keeps pollutants created by your engine from being released into the atmosphere. It also helps keep the engine oil clean and prevents crankcase pressure from building up. 1. Rough idle or stalling: If the plunger is stuck open, the PCV valve will allow too much air to enter the engine. This can cause a lean air-fuel mixture, resulting in a rough idle or stalling. 2. Illuminated check engine light: The powertrain control module (PCM) monitors the engine’s air-fuel mixture via oxygen sensors. If the PCM detects a lean or rich condition caused by a bad PCV valve, it will turn on the check engine light. 3. Oil leaks: One job of the PCV valve is to reduce crankcase pressure. A PCV valve that is clogged or stuck in the closed position will allow crankcase pressure to build. This can cause oil to leak through gaskets and seals. It can also force oil into the air cleaner assembly. 4. Sludge: A faulty PCV valve can allow blowby to mix with the engine oil, resulting in sludge buildup. Sludge can cause extreme engine damage if left unchecked. 5. Increased emissions and fuel consumption: A clogged or closed PCV valve can also cause the engine to run richer than normal, meaning there’s too much fuel in the air-fuel mixture. This increases emissions and fuel consumption. 6. Poor idling and acceleration: On the flip side, a valve that is stuck open can create a lean air-fuel mixture, which can cause backfires, poor idling and sluggish acceleration, and make it hard to start the car. The PCV valve is typically found in the engine valve cover. 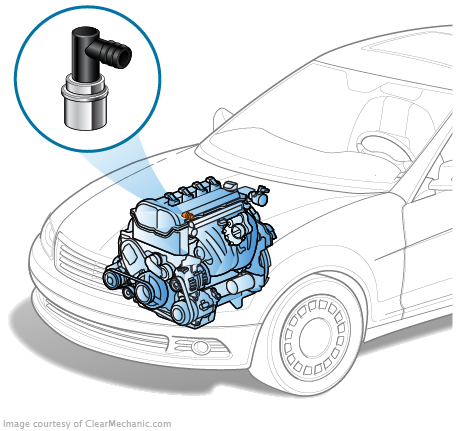 A vacuum hose connects the valve to the intake manifold or throttle body. When your engine is running, it’s normal for combustion gases to leak past the engine’s piston rings and into the crankcase — this is called blowby, and if left unchecked, blowby would create a great amount of pressure and damage your engine. But you don’t want those gases escaping into the atmosphere, either, as they’re harmful to the environment. To reduce pollution and regulate blowby, a spring-loaded plunger inside the PCV valve redirects the gases from the crankcase back into the engine, where they are burned. Under heavy load or acceleration: The spring inside the valve unseats the plunger, allowing maximum gas flow through the PCV valve and back into the engine. When the amount of blowby exceeds the full capacity of the PCV valve, the gases are rerouted from the intake manifold, to the engine air cleaner assembly. This can leave oil in the air filter or its housing, and isn’t ideal. At idle: The engine creates a lot of vacuum at idle, as the throttle is mostly closed. This condition causes the plunger inside the PCV valve to be pulled partially off its seat, toward the engine intake manifold. This restricts the amount of gas flowing through the PCV valve. Because the engine doesn’t produce much blowby at idle, this isn’t a problem. In case of backfire: The PCV valve also provides protection when backfires occur. A backfire happens when a spark plug ignites the fuel in its cylinder out of turn, and creates excess pressure in the intake manifold. This forces the PCV valve plunger back toward the crankcase. The valve closes, preventing the backfire flame from entering the crankcase, where it could ignite fuel vapor and do further damage. A faulty PCV valve should be replaced. This is usually a simple task, as you should be able to pull the old one out and put a new one in its place. On some vehicles, however, the PCV may be built into the valve cover. In cases like this, the entire valve cover assembly must be replaced, which is a more complicated task and may be best left to a certified mechanic.